What’s that sitting in the base of that piano? It’s a jar of water. Why? Sometimes a piano technician will find a long-forgotten dusty jam jar in the bottom of an old piano. Or an owner will ask about placing a jar or tray of water there, having heard that it’s a good idea. The notion behind this is that very low humidity is bad for a piano and that by keeping some water inside the piano you can maintain humidity. 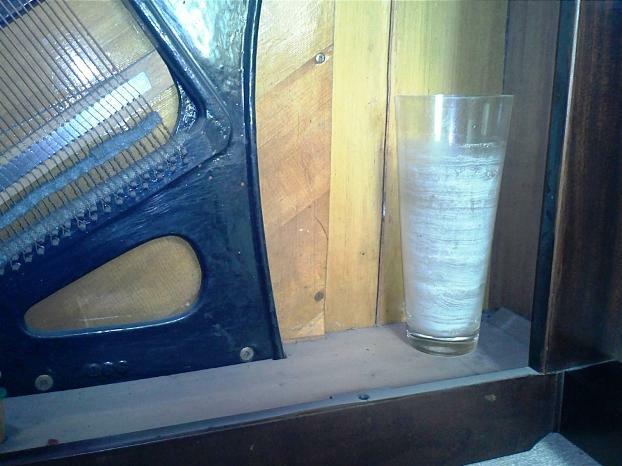 I don't believe that in the ordinary domestic situation it's ever helpful to put a jar of water in the piano. Our problem in this part of the world is dampness, not dryness. 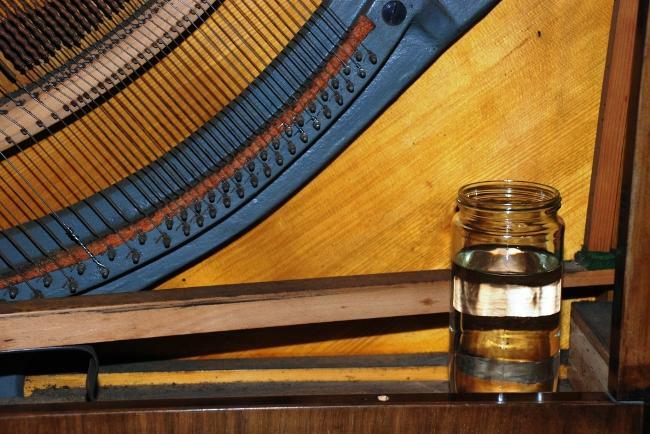 A couple of websites of UK piano tuners mention the jar of water idea as a practical option. But they are tuners working much further south in Britain. I have seen too many pianos full of “arrested” old mildew because they’ve spent a lot of their life being too damp, to think that jars of water are a good idea here. And too many pianos with actions that are sluggish because flanges are swollen due to high humidity. 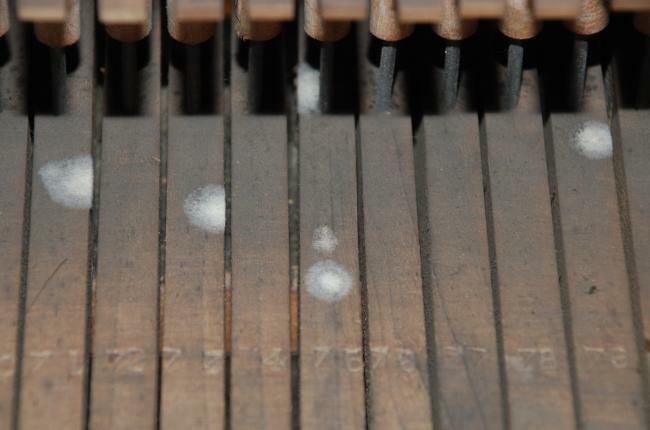 Here's a photo of part of an upright piano action with what I call "arrested" mildew; for a time the piano was in a damp environment and mildew started to grow. Moving the piano to a warm dry home stopped further growth, but the cobwebby filaments tend to remain. 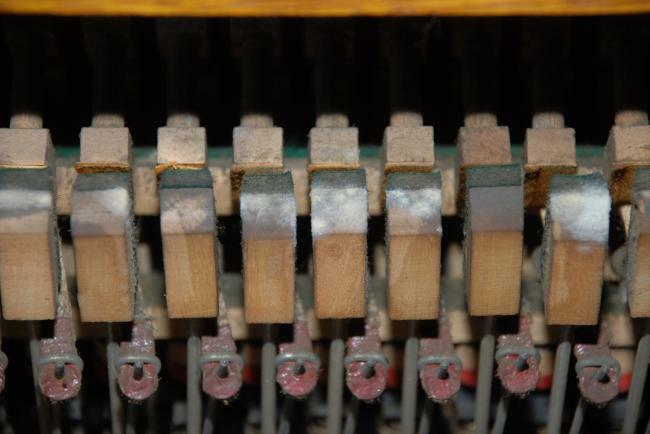 The cobwebby texture of the mildew is seen on the two capstans in the photo below (wooden dowels at the back on the keys). 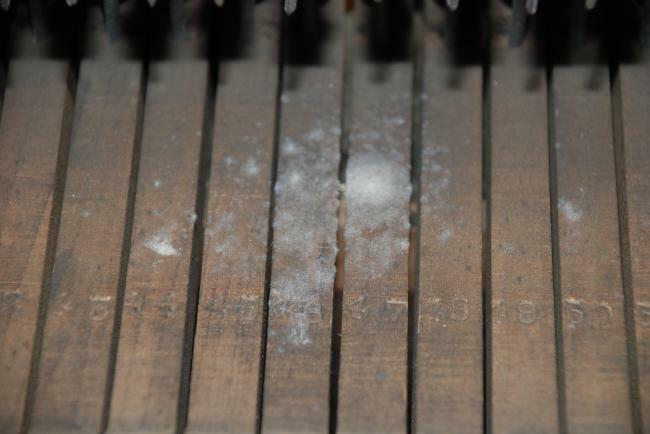 In attending to this piano, all of this old mildew was cleaned out using a vacuum cleaner and antibacterial wipes. The dreaded container for water! 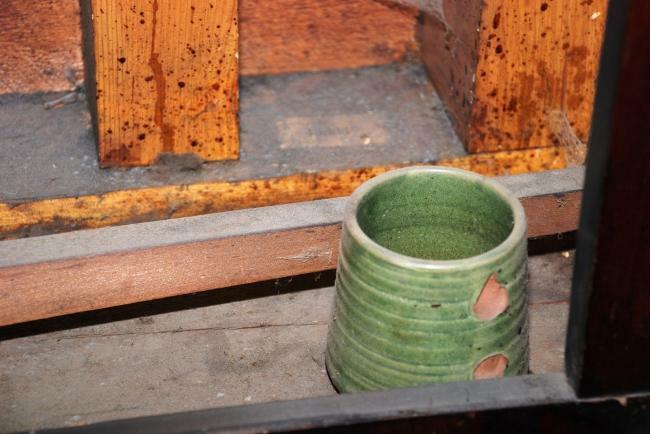 Note the mildew on the pedal rail too. 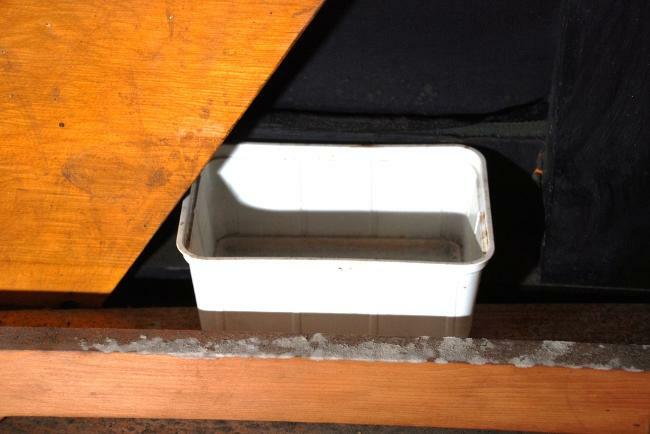 Was this water container put in the piano in spite of the presence of mildew? Or did the mildew happen (or get worse) because it was put in? I don't know. But I know it was a Bad Idea. But what about pianos that are not in the home situation? What of sensitive concert instruments in public buildings? Or very old pianos donated to residential complexes with dry air due to forced-air central heating maintained at high temperature? In the case of concert grand pianos there is of course no place inside the piano to put a jar of water anyway. Changes in humidity due to being moved in and out of storage, or from crowds of concert-goers or other visitors coming and going, can indeed cause problems. But the answers in such situations don't include jars of water. Control of the ambient conditions in the building by efficient air conditioning is the best solution. But realistically this is not always possible. Instead, a system can be used in which the environment in and around the piano is kept more steady. This is achieved by fitting a Piano Lifesaver system, made by the Dampp-Chaser company, to the piano. 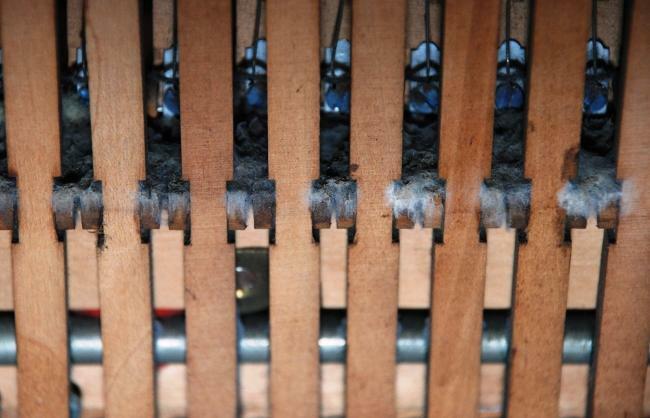 A water tank, humidifier bar, humidistat and dehumidifier bar are all fitted and connected in such a way as to maintain a more steady relative humidity in the piano. These systems, properly fitted, can be highly effective (as long as they are kept plugged in and the water level regularly checked). 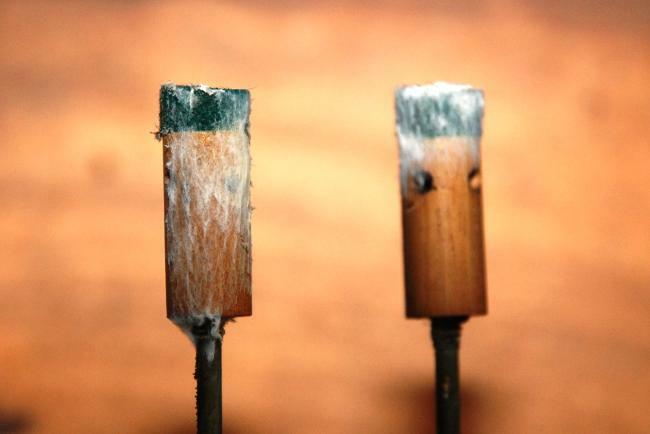 For very old pianos in very hot dry environments, well, frankly, there is little hope anyway. Jars of water won’t make much difference. Such pianos (often cheap and inferior even when brand new over a century ago) sometimes suffer from the hide glue in all the joints drying out and becoming brittle, and this can be accelerated when the piano is brought into the hot dry atmosphere of a residential care home. Such instruments are not in general worth the expense of fitting a Piano Lifesaver system. Sometimes I have to advise against the expense of even trying to tune such donated old pianos. What about the opinion of some tuners that the water jar is helpful? They are either a) not in the West of Scotland or b) wrong. In any case, what is their evidence? I have never seen any published article in a reputable source establishing any evidence base on this matter. As well as not putting your daughter on the stage, Mrs Worthington, don’t put the jam jar in the piano! In point of fact, what is often helpful in the west of Scotland, especially with pianos in infrequently used rooms, community halls and choir practice rooms, is to fit a dehumidifier bar. These are made by the Dampp-Chaser company, and in the USA (and sometimes in the UK) are used as part of a 'Piano Lifesaver' climate control system as outlined above. In this part of the world, the dehumidifier bar, a low wattage tubular heater, is often very useful on its own. It prevents moisture condensing inside the piano.